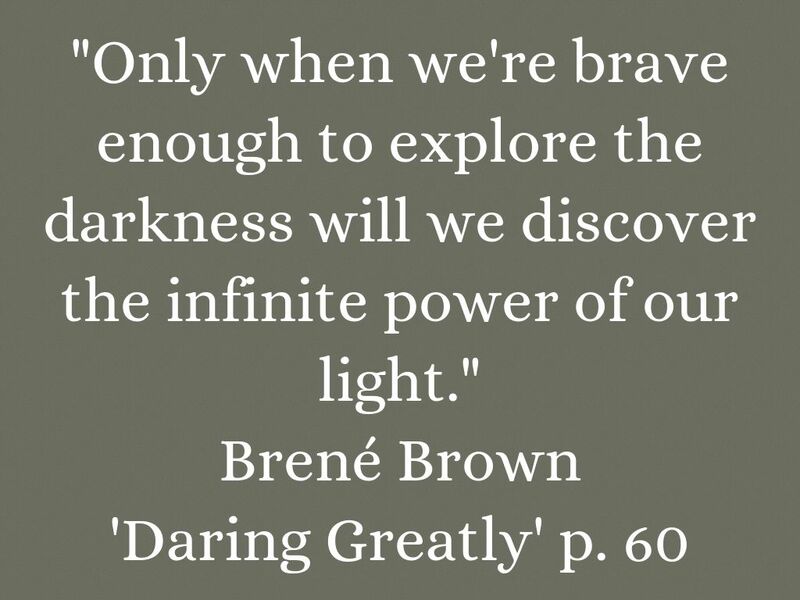 "Only when we're brave enough to explore the darkness will we discover the infinite power of our light." 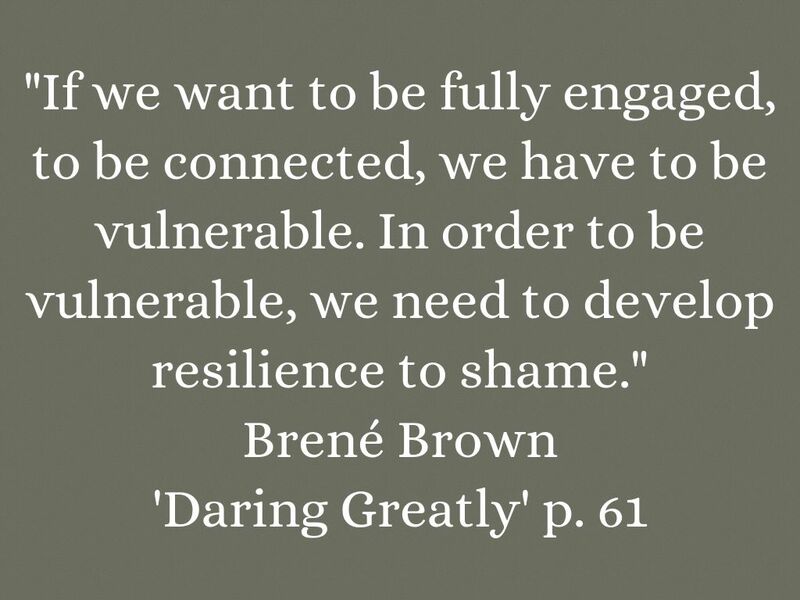 "If we want to be fully engaged, to be connected, we have to be vulnerable. 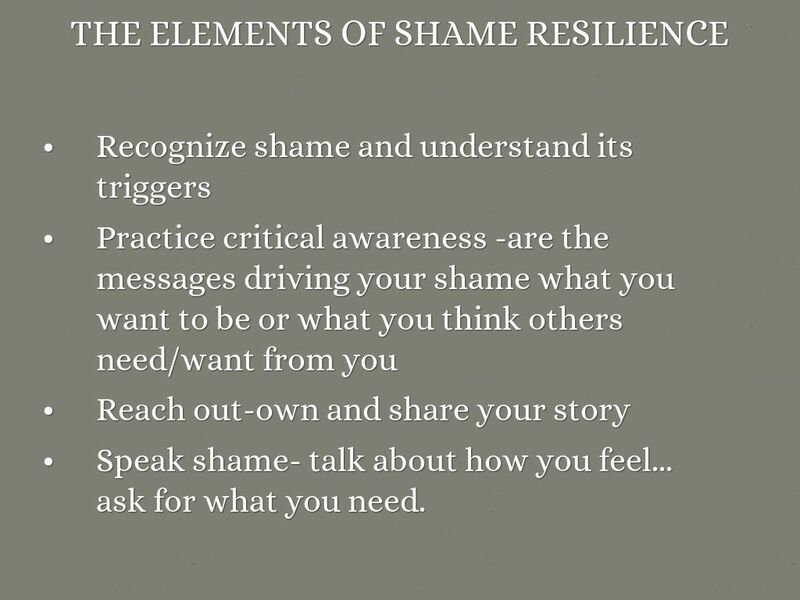 In order to be vulnerable, we need to develop resilience to shame." "Shame derives its power from being unspeakable... 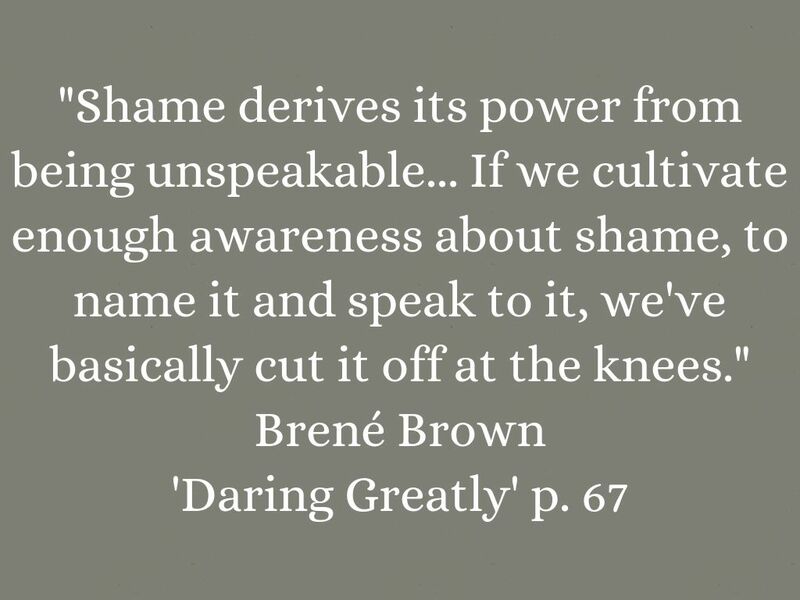 If we cultivate enough awareness about shame, to name it and speak to it, we've basically cut it off at the knees." 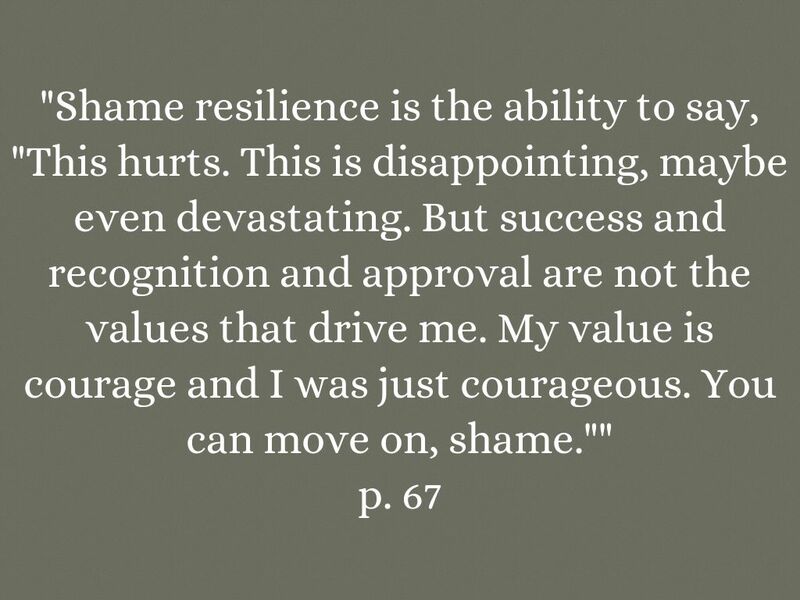 "Shame resilience is the ability to say, "This hurts. This is disappointing, maybe even devastating. But success and recognition and approval are not the values that drive me. My value is courage and I was just courageous. You can move on, shame."" 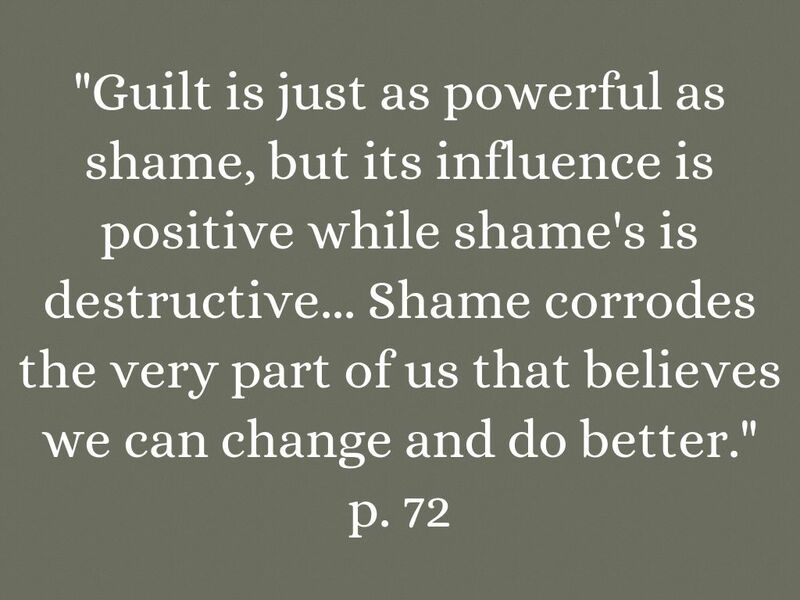 "Guilt is just as powerful as shame, but its influence is positive while shame's is destructive... Shame corrodes the very part of us that believes we can change and do better." 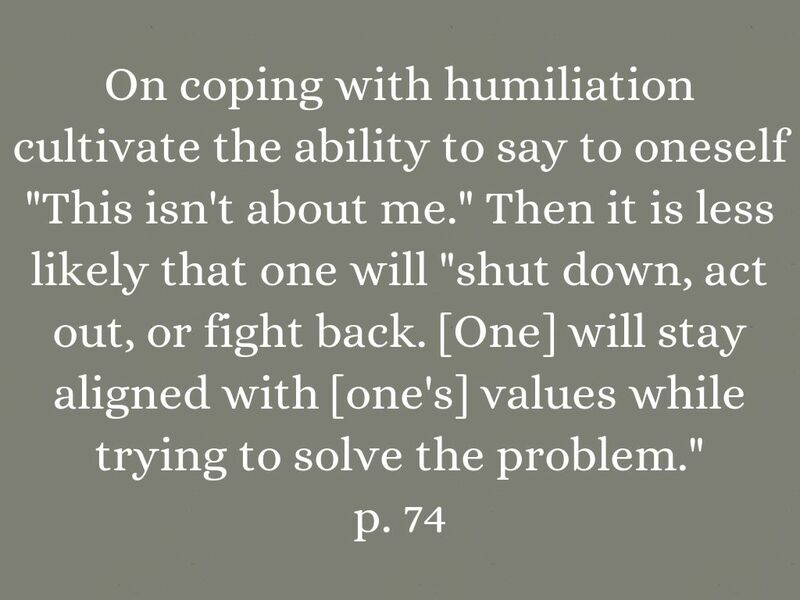 On coping with humiliation cultivate the ability to say to oneself "This isn't about me." Then it is less likely that one will "shut down, act out, or fight back. [One] will stay aligned with [one's] values while trying to solve the problem." 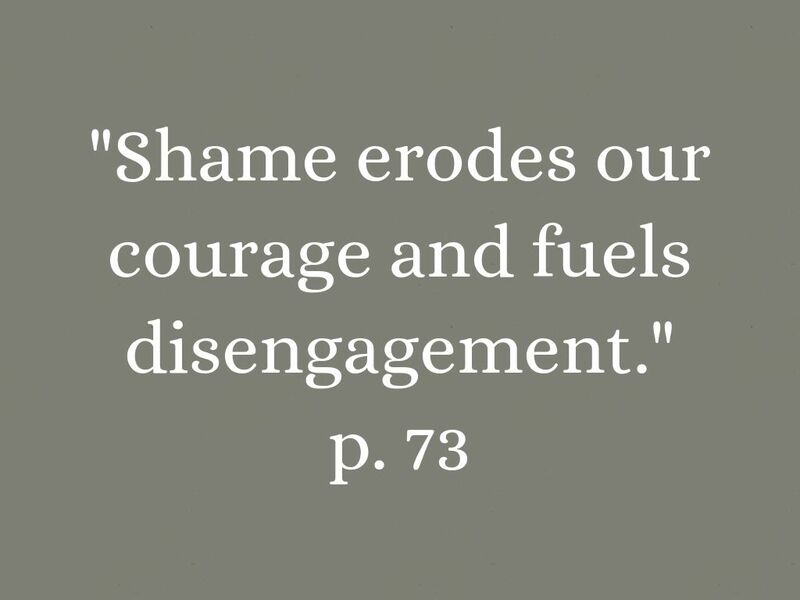 "Shame erodes our courage and fuels disengagement." 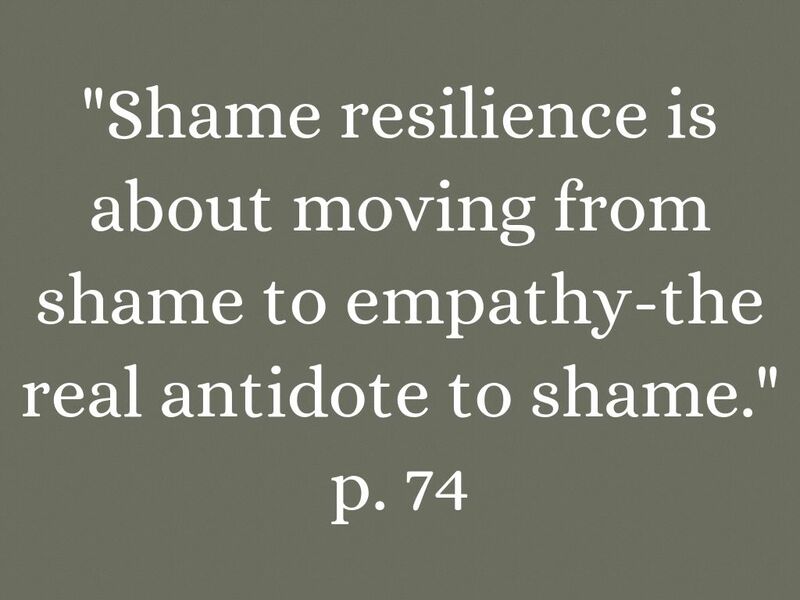 "Shame resilience is about moving from shame to empathy-the real antidote to shame." 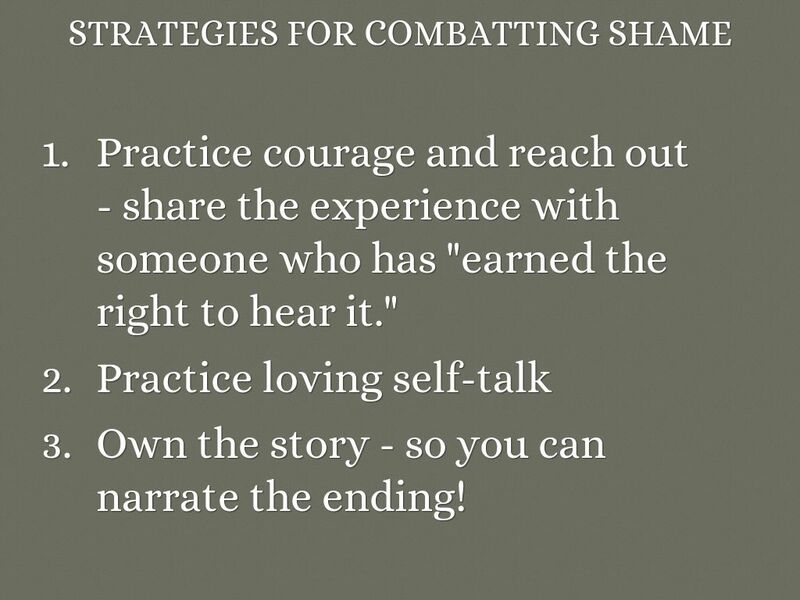 "If we can share our story with someone who responds with empathy and understanding then shame can't survive. 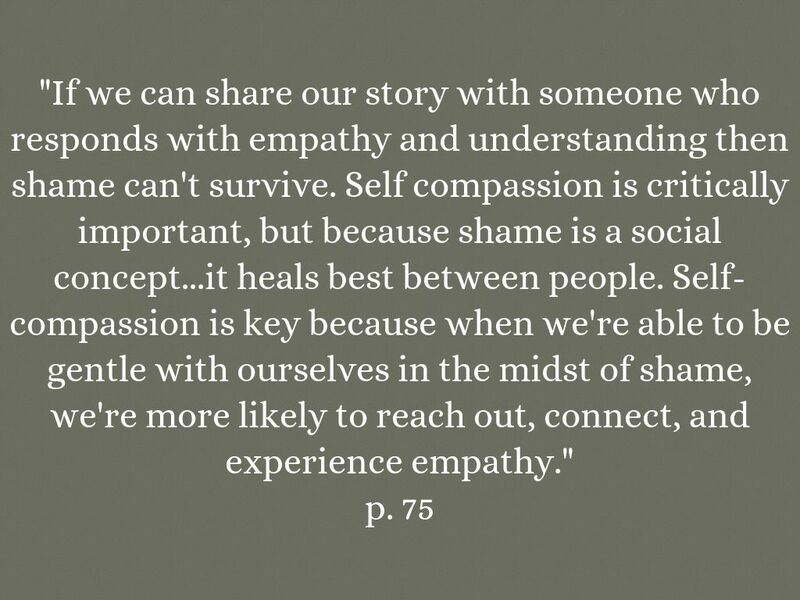 Self compassion is critically important, but because shame is a social concept...it heals best between people. Self-compassion is key because when we're able to be gentle with ourselves in the midst of shame, we're more likely to reach out, connect, and experience empathy." Speak shame- talk about how you feel... ask for what you need. Practice courage and reach out - share the experience with someone who has "earned the right to hear it." Own the story - so you can narrate the ending! 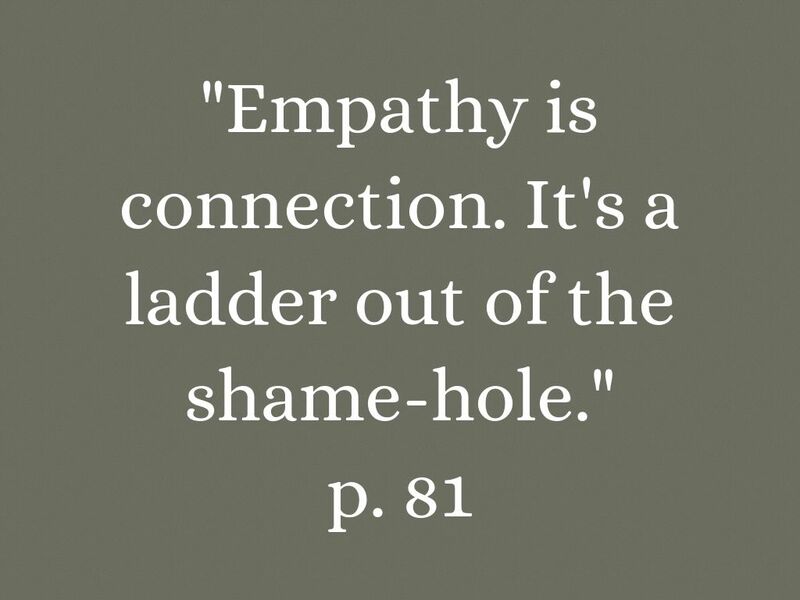 "Empathy is connection. It's a ladder out of the shame-hole." 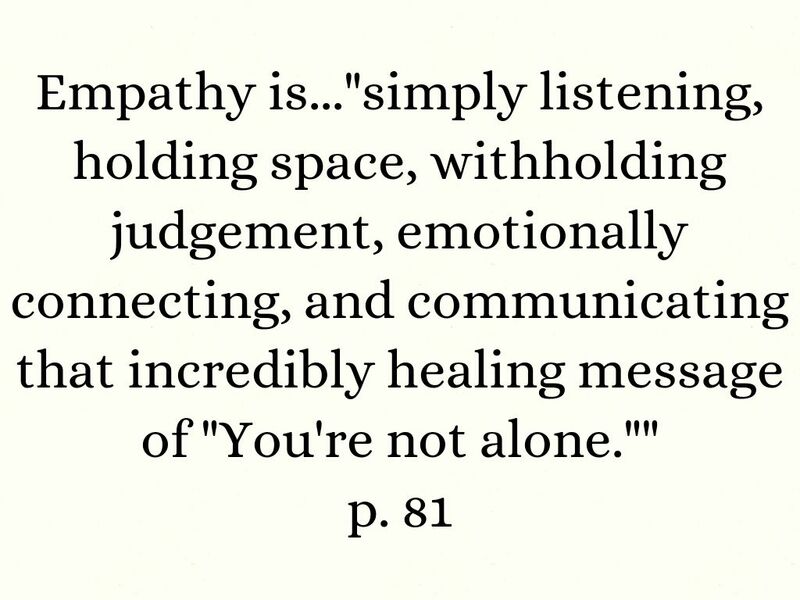 Empathy is..."simply listening, holding space, withholding judgement, emotionally connecting, and communicating that incredibly healing message of "You're not alone."" 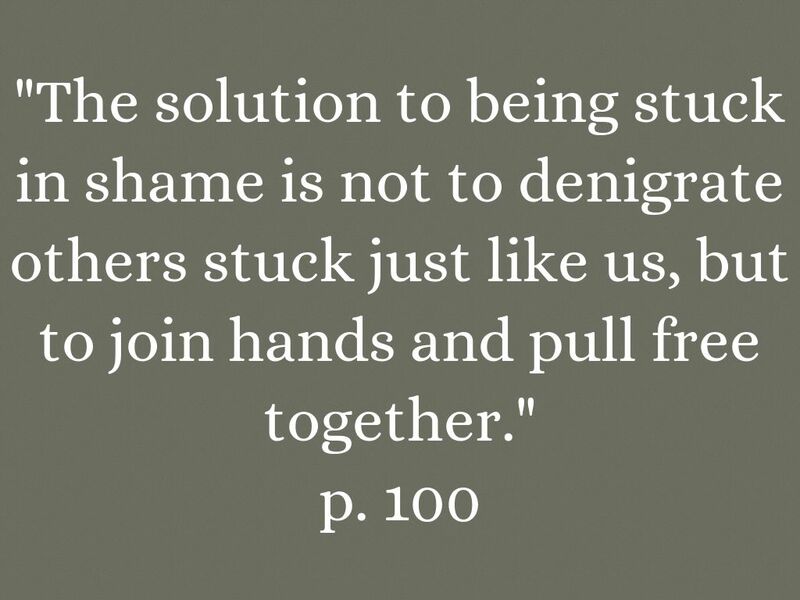 "The solution to being stuck in shame is not to denigrate others stuck just like us, but to join hands and pull free together." 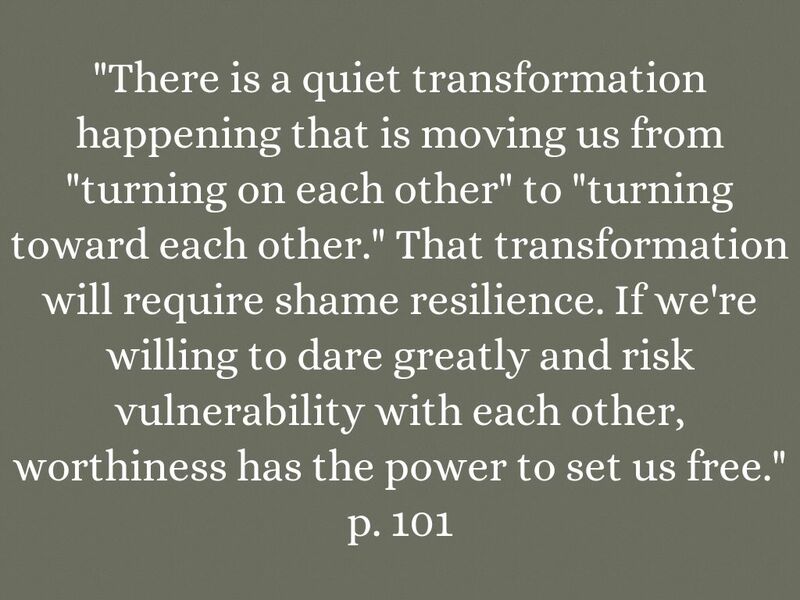 "There is a quiet transformation happening that is moving us from "turning on each other" to "turning toward each other." That transformation will require shame resilience. If we're willing to dare greatly and risk vulnerability with each other, worthiness has the power to set us free." "We have to be able to talk about how we feel, what we need and desire, and we have to be able to listen with an open heart and an open mind. There is no intimacy without vulnerability." 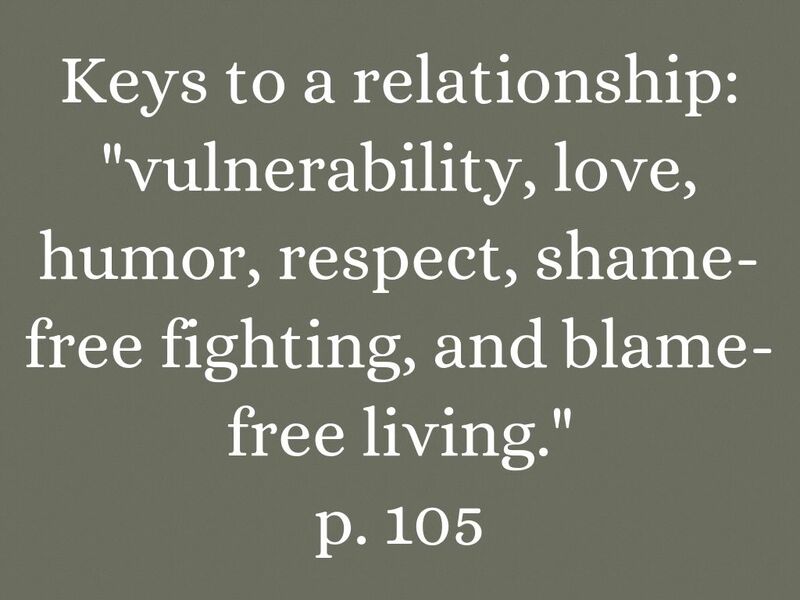 Keys to a relationship: "vulnerability, love, humor, respect, shame-free fighting, and blame-free living." 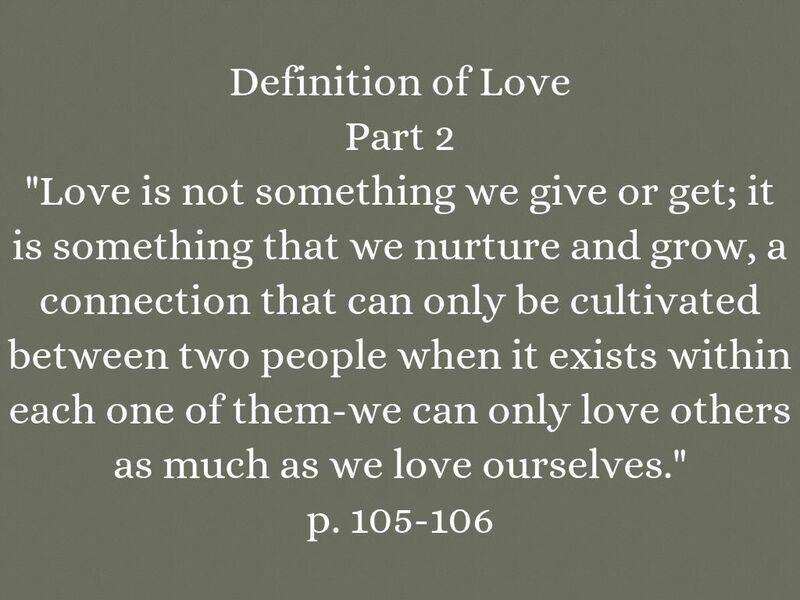 " We cultivate love when we allow our most vulnerable and powerful selves to be deeply seen and known, and when we honor the spiritual connection that grows from that offering with trust, respect, kindness, and affection." 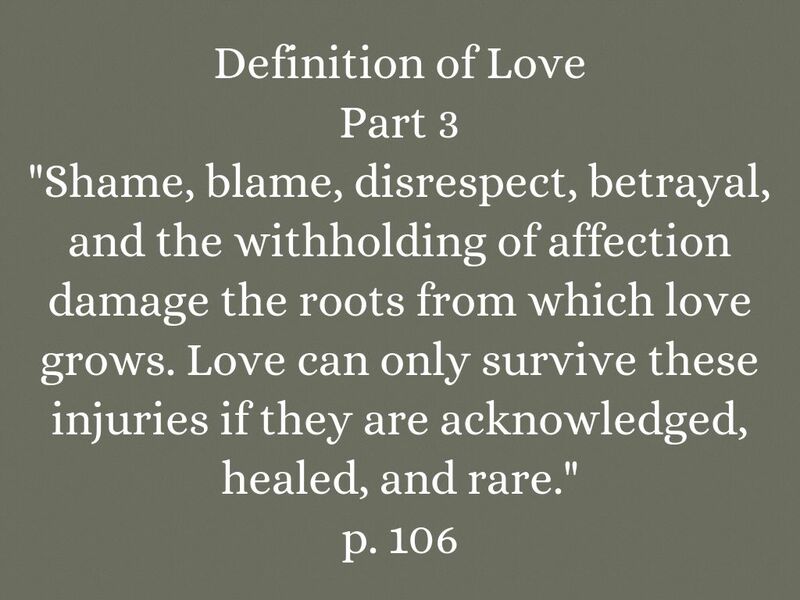 "Shame, blame, disrespect, betrayal, and the withholding of affection damage the roots from which love grows. Love can only survive these injuries if they are acknowledged, healed, and rare." 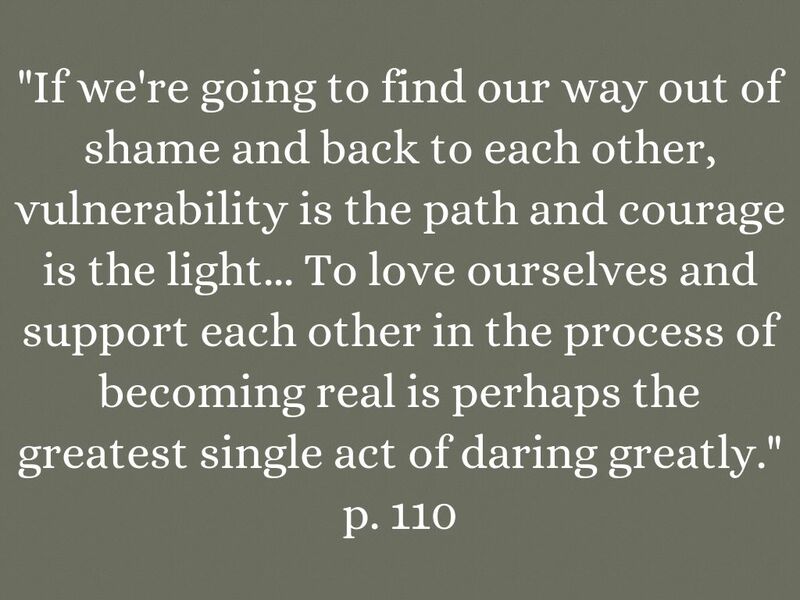 "If we're going to find our way out of shame and back to each other, vulnerability is the path and courage is the light... To love ourselves and support each other in the process of becoming real is perhaps the greatest single act of daring greatly." 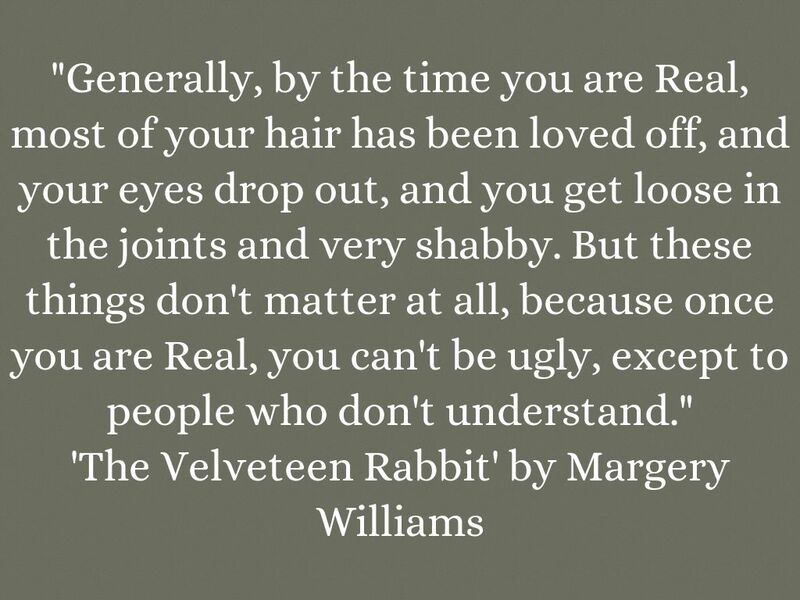 "Generally, by the time you are Real, most of your hair has been loved off, and your eyes drop out, and you get loose in the joints and very shabby. But these things don't matter at all, because once you are Real, you can't be ugly, except to people who don't understand."